I love anything with balsamic vinegar, so I thought this recipe was worth trying. I get daily recipe emails from a few different places. One of them is Allrecipes.com, whose website I frequent. This one sounded good and I love anything with balsamic vinegar, so I decided to try it. It’s one reason I bought so many cans of diced tomatoes last time they were on sale. I had several recipes calling for them and this was one of them. Overall, I think everyone liked it. 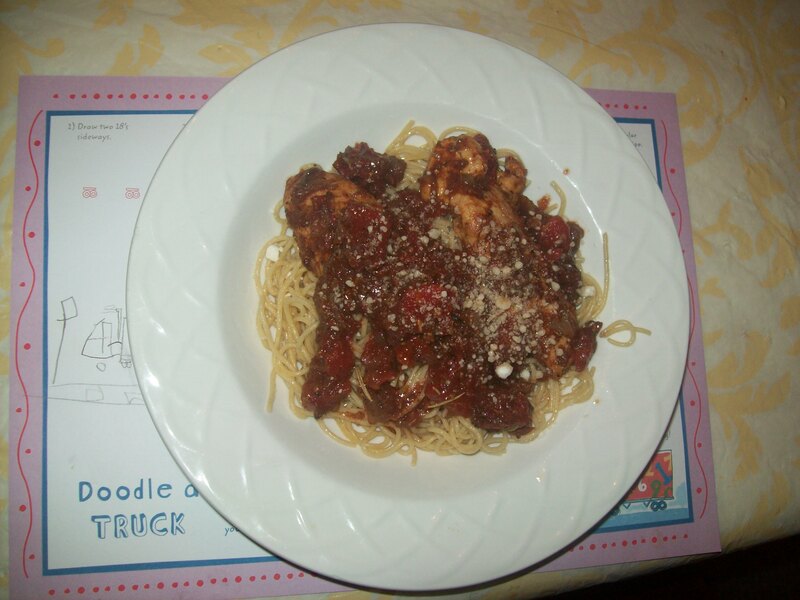 We served it with whole wheat spaghetti, so anyone who didn’t like the chicken could have pasta and the tomatoes were big enough that they could be picked out if anyone didn’t like those. I liked the whole thing and I think I’d make it again. 1. Season chicken breasts with ground black pepper and garlic salt. Heat olive oil in medium skillet and brown the onion and seasoned chicken breasts. 2. Pour tomatoes and balsamic vinegar over chicken and season with basil, oregano, rosemary and thyme. 3. Simmer until chicken is no longer pink and juices run clear, about 15 minutes. We served ours on a bed of whole wheat pasta, which worked out great! ← It was like a crepe buffet! Minus the noodles (I’m GF), this would be PERFECT! Thnx! Oooh, I love anything with balsamic, too — and I made a very similar chicken recipe a few weeks ago (probably from AllRecipes, too). So tasty!